I shift a little in my seat – a wooden bench outside of the shop by the Square – crossing one leg over the other and leaning back into the shade. From inside the shop, the radio plays a reggae version of Adele’s Don’t You Remember, followed by a news brief announcing Tessanne Chin’s advancement in America’s popular reality TV show, The Voice. “Yeah mon.” I don’t bother to mention that I’ve already been waiting forty minutes. It’s Saturday, nearly eleven a.m., and my stomach rumbles. I think about that Jamaican patti I’ve promised myself when I get down to the Bay (Morant Bay), and shift in my seat again. A dog wanders into my vision, sniffing the ground for scraps before curling up in the shade across the road. A barefoot man carrying bananas on his head slowly makes his way past the shop. A woman with her baby sits down beside me. The cool breeze sweeps in from the valley and offers me a brief reprieve from the heat. Finally, a taxi arrives. A Honda model from the late 90’s, with a white license plate and ripped seat cushions, the driver reaches over and opens the passenger door from the inside, then behind him to open the backseat door. I allow the mother and her child to sit in the front, so they wont have to small up, and I settle down in the back. A few minutes later, another larger woman joins me in the backseat, then a farmer carrying a machete, the blade wrapped in newspaper. We start down the road, winding around blind curves before making another stop for a teenager with a school bag. He opens my door and climbs in beside me, forcing the three of us to shift closer and make room. This is what’s known in Jamaica as smalling up, and it’s something I’ve become very accustomed to. Rarely does one travel publically without experiencing this type of close encounter. With an hour’s car ride ahead of us, I lean back and allow the people on either side of me to absorb the sways and bumps of the vehicle, as we wind around curves, dodging potholes and goats. While we make our descent from Cedar Valley, I keep my eyes fixed on the passing scenery. We drive through several neighboring communities, past sugar cane fields, cow pastures, and Serge Island Dairy Factory. Meanwhile, the road continually alternates between patchy concrete riddled with potholes, or a sand or dirt path. Though the windows are down, I feel sweat gathering at the base of my hairline, beneath my arms, and between my legs. Just a few more minutes, I think, recognizing my surroundings and smelling the sea air. Morant Bay is a flurry of activity. Even before our vehicle stops, we pass men walking around selling hair combs, kitchen knives, fly swatters, bag juice and chips. Taxi men call out their destinations, looking for more passengers to fill their vehicles. “Town! Town!” That’s Kingston. “Town, baby?” I’m asked the moment I exit my car. From the main road, I walk uphill to get into the shopping area of Morant Bay. I pass vendors under canopies and street carts. People shout out to promote their product. I hear calls for movies, maxi dresses, juicy watermelons and pineapples. The cat-calls begin here too. In Jamaican culture, men often like to woo the women, and as a white female, I’m exceptionally exotic. This is a big adjustment that many of us PCJ ladies find infuriating. After a year of it, most of the remarks I hear fall on deaf ears. I nod to him and keep walking. Finally, I reach Queen’s Street, which runs through the heart of the Bay. Along the roadside is an NCB bank, the Digicel store, Tastee Patti, Lee’s Books, St. Thomas Parish Library, Scotia Bank ATMs and so much more. Famished, I duck into Tastee and join the long line. Once I’ve sated my hunger, grocery shopping is next on the agenda. Hoping to avoid the hustle-bustle of peddlers and cheesy pick-up lines, I move quickly toward the corner and turn down a side street. About fifty feet in, past more street vendors and pushcarts, is Joong’s Supermarket. Inside, the store is busy, and despite large ceiling fans on high speed, it’s still only slightly cooler than outside. Picking up a basket, I slip through the turn style and start down the isles. The shelves aren’t too different from what I’m used to back home. While there certainly isn’t as much brand variety, I can find almost all of the same things. I also usually have my choice between a Jamaican brand, and an American one. I grab some Charmin toilet paper. On my PC budget, it’s easily the most expensive item on my list, but to me, it’s worth it. I also pick up a bag of cat food for Bowser. Then I stroll down the isles collecting various food items. I reach for the veggie chunks, a Jamaican product made mostly from soy and packaged in dehydrated form. They make a great substitute for meatballs in your spaghetti, or a tasty addition to your chicken-flavored Ramen. I also like to use them in my weekly Teriyaki Vegetable Stir-Fry; a meal I’ve proudly learned and perfected during my service. Other items on my shopping list include pasta, milk (in a powdered form, to be mixed with water), tang, wheat crackers, granola bars, and my other cherished splurge: Honey Nut Cheerios. I grab a snack-sized package of Oreos on my way to the cash registers. The last thing I do before the leave the store is pull out my MegaMart bag and transfer my groceries. MegaMart – just so we’re on the same page – is a little like a Costco. It’s located in three major Jamaican cities, but none of them are in St. Thomas. 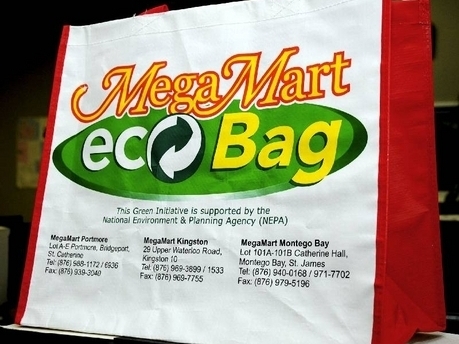 While Group 84 was training in Kingston, we discovered that you can buy a MegaMart reusable shopping bag for $100 (or $1 USD), and that they’re a great way to carry multiple or heavy items more comfortably. Almost every volunteer on island has one, and apparently, so do the Jamaicans! With my MegaMart bag in hand, I blend right in. I recognize my friend Warren’s* voice. A Rasta man with shoulder length dreadlocks and a star-spangled wetsuit hurries over to me. He’s holding a spear gun in one hand, and a dozen colorful fish and lobster on a fishing line in the other. Spear fishing is one of the many ways Jamaicans bring sea-life to the markets. I greet him enthusiastically. About a year ago, when I first got to St. Thomas, Warren approached me to say hello. Like most of the people in the Bay – cat call boys aside – he just wanted to know who I am. After all, I’m not the only volunteer in this parish, and all of us come into the Bay to shop. Wanting to earn some integration points, I took the time to talk to him, and after a few short months, he had become a good friend. “Yeah? The water was so cool today,” he tells me, in Patwa of course. “But I dove too deep and popped my ear.” He shakes his head and blinks his eyes a little. “Anyway, you are looking so nice today. Wey yaa go now?” Where are you going now? “To the market,” I tell him, gathering my bag and starting back toward Queen’s Street. Warren disappears into the crowded market place. Under a mismatched roof of tin and blue tarp, Morant Bay Market is easily the busiest place in the Bay. It’s hot, with rows and rows of tables and carts; merchants selling everything from kitchen utensils, flatware, clothing, shoes, belts, wallets, jewelry, hair accessories, fish, meat, fruits, and vegetables. A maze at times, I wind through the isles, duck under low hanging tarps, wrinkle my nose as I pass the fishery quarter, and make my way to the Southeast corner of the market. There, I step into a ray of sunshine, take a breath of fresh air, then walk under another blue tarp to find Brenda. * Hailing from Cedar Valley, and the mother of one of my students, I always like to buy my vegetables from her. “Every time, Brenda,” I tease. “Arrite, arrite. Here.” She holds up a sweet potato and drops it in the bag. “Brawta,” she tells me, which is a Jamaican term for freebie. Finally, I’m finished. It’s a relatively quick trip today, since I had no plans with other volunteers, no need to visit the ATM, and no bills due for another week. I feel a bead of sweat roll down the crease of my spine and settle in the waistline of my pants. Placing my vegetables in my MegaMart bag, I steel myself for one last trek in the hot sun through the Bay. Cars are honking. I hear a baby crying. Another bead of sweat rolls down the side of my face as I tighten my grip on the handle of my bag and continue along the road and back to the taxi stand. Once I reach, I set my bag down and look around. 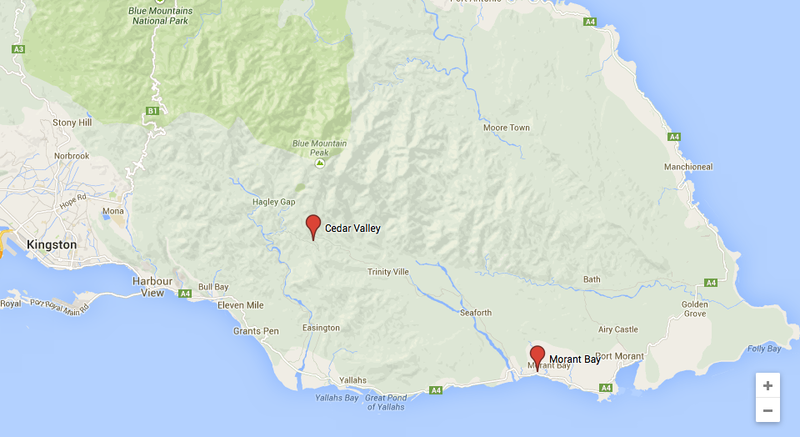 I see a couple of taxis for my surrounding communities, but nothing for Cedar Valley. Typical. Then I begin looking at the people, and recognize a few from up the mountain. A student from my school smiles at me, then whispers in her mom’s ear and points. I smile politely. A few minutes later, a mini bus with a faded paint job and a red license plate pulls up; Kevin’s* bus. He gets out of the driver’s seat and opens the sliding door. While we – about ten of us – load into the vehicle, Kevin expertly arranges our packages under our seats and between our legs. More Cedar Valleyians arrive and more bags and people are packed in. I can’t help but marvel as the skillful way Jamaicans can load a vehicle. It’s the same sense of awe I experience when watching my Mom load the dishwasher back at home. Like Tetris, I think. I’m sticky, and my skin feels grimy. My mouth is dry and my hair is wet with sweat. I’m exhausted, and want nothing more than to jump into a swimming pool. I suppose I’ll have to settle for a cold shower. As the last person – and perhaps one too many – squeezes himself into the bus, the sliding door slams shut and Kevin returns to his seat. The engine protests at first, then sputters and starts. With a jerk, we pull out of the taxi stand and make our way back up to the mountain to Cedar Valley. * All names have been changed to protect their identities.